Are You having question about what art therapy is? or wanting to become an art therapist? 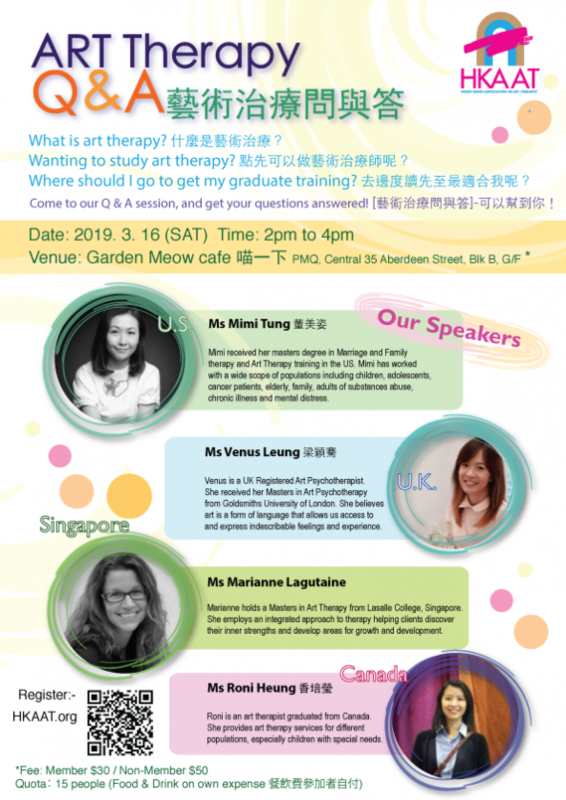 Now is your chance to speak with our 4 professioanl art therapist who were trained in the US, UK, Canada, and Singapore to share you the valuable information of what or where to study. You can also ask any question related to art therapy in a causal conversation meeting with them. Mimi received her master degree in Marriage and Family therapy and art therapy training in the US. Mimi has worked with a wide scope of populations including children, adolescents, cancer patients, elderly, family, adults of substances abuse, chronic illness and mental distress. Roni is an art therapist graduated from Canada. She provides art therapy services for different populations, especially children with special needs. Venus is a UK Registered Art Psychotherapist. She believes art is a form of language that allows us access to and expression of indescribable feelings and experience.